Males are more brightly coloured with slightly more elongated and elaborate fins. A peaceful fish, keep in groups of 6 or more. Do not keep with long-finned fish as these fish may nip. 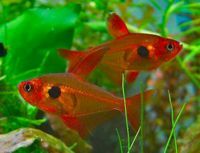 A pretty fish that looks similar in colour and shape to the Serpae Tetra but the body is slightly more elongated and the black mark on their flanks is more rounded.